Occasionally ideas bounce around my head, begging to be developed. One particular genre is currently calling to me. I was considering creating a zombie (don’t laugh) themed blog. In the zombie blog, I would do some book and television show reviews, maybe get interviews with different authors or organizations, provide a platform for fan groups, have an online debate with vampire fans, and just have some fun with it. My zombie blog would be good fun, a way to separate the rantings and observations of my current blog with a more themed one. Zombie blog was inspired by the art, media and stories that have been on my reading list lately. I know an art student and admire her work so much I want her to create some original drawings making zombie blog even more creative. Zombie blog is a pet project for fun and entertainment, where like-minded zombie fans can explore and be amused. It is in the spirit of creative, good clean (undead) fun. And then I did some research on other zombie themed blogs…. As I researched, I began to rethink my zombie blog idea. A quick search of the internet led to a multitude of themed blogs, and yes many of them were zombies so much for the “original” part of my idea. Some of the zombie blogs are doing what I had in mind by promoting the genre, author interviews, book, movie, show reviews and links to fun events. However most zombie blogs are, for a lack of better term, completely INSANE! Seriously, I hope that these blogs are a joke and not meant to be taken seriously otherwise there is some scary stuff out there. Most of the zombie blogs contained so much nonsense from people about the “reality” of a zombie plague happening, or what weapons are the best to use, or exactly how a man-made virus would turn people into zombies. On one blog there was even a study in Philadelphia that had a time line for a zombie epidemic infection that would begin an apocalypse. One company has created a line of weapons available on their websites to fight off the zombies. What in the name of all that is Romero is going on? Maybe most of the zombie blogs started off as my idea had; a tongue in cheek idea. 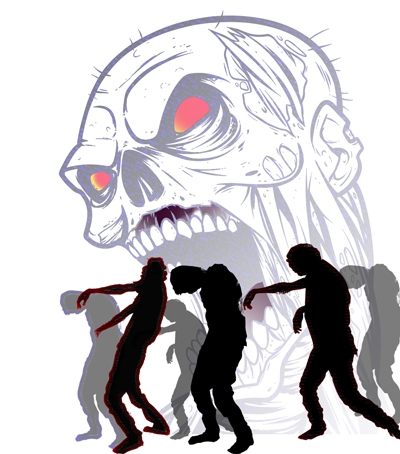 Then the infection of “zombism” came over them, making the site live long after its undead shelf life. I for one, am all for digging in and having a playful site, but the zombie blog populace actually seem to either 1) believe zombies are real or 2) promote very bad information to people who are mentally unstable enough to believe zombies are real. Here is a case in point; a medical student in the UK wrote a paper attacking a zombie blog site. He referred to the creators of the blog as a bunch of conspiracy theorist who do not know a damn thing about medicine. He went on to argue that Max Brooks (yes, Mel Brook’s son and the writer of World War Z and Zombie survival guide) was not serious when he published the first book on surviving zombie Armageddon. Do we need scientific clarification of that little bit of information? What happened to having fun? I am sure that there are people who TRULY believe in vampires and some even believe vampires sparkle. I just wonder what mental infliction causes people to believe in and fully embrace the idea of the reality of UFOs, werewolves, vampires, zombies, and the ability to cast spells. Truly, someone should have stepped in when they were children to take away their dungeons and dragons game. Oh wait, these are the same people who actually LARP their characters in the local park on the third Sunday of the month and have deep discussions on the merits of a spork as a weapon for their RPG character. As I take a deep breath and calm down, I realize that maybe I am the one that is being a little over the top. I do not know the drive behind the blogs. It could be that they are sitting at their computer, getting people like me all wound up. I love the zombie apocalypse genre of books and movies. I feel that beyond the smelly, walking dead people, there is a social message. I also believe, as the organization Zombie Squad, that if you are prepared for the walking dead, then you will be prepared for any other disaster that may occur. There is a part of me that is sitting in the coffee house, listening to a group of people argue about what they will do WHEN, not if, the dead would rise. Not one of them had my answer…run like hell! You have some great points. Many of the movies and books on zombie lore are based around the fears of the generation. Earlier movies had the genesis of zombies being related to toxic waste as it was the fear of the 70’s and 80’s in the nuclear age of the time. Later stories have a more biological cause for the outbreak. As science and genetics become more advanced, the repercussions are a source of fear. This breeds a sense of the unknown and gives stories a dimension. A recent zombie movie series “28 Days Later”, and its sequel, have the infection being more of a biological mutation of rabies. Many of our fears get translated into pop culture. On your second point, that was a great insight into modern fascination with the electronic gadgets. If we stray too far away from our social connections and reliance on electronics, how will we function as a society if something would happen to disrupt these devices? Stillthebadgirl…first off, “zombies and occassional naughty behavior” should NEVER be in the same sentence. That is just wrong on so many levels. But, hey, everyone has their little kinks. It is also good to start every conversation with “I do not believe in zombies”. It keeps everyone from rolling their eyes at you and discounting the rest of the words out of your mouth. I should try that in all situations. Maybe I should start my next business meeting with that phrase. That would definitely get everyone’s attention. Thank you for reading and come back again. October will have many more zombie post that you might want to weigh in on. Just don’t share anymore of those naughty behaviors. That could get uncomfortable. according to my son, if you wrap yourself in bubble wrap you are safe from said zombies because they have a tough time chewing through that stuff. That might actually work. I will have to stock up on bubble wrap. Running faster than the other people around you might be a challenge. Thank you for your comment. Hey! What is that sneaky attack on Dungeons & Dragons and related RPGs? To come back to the main subject of your article, why does it seem so outrageous to you that some people believe in zombies, werewolves, ghosts and such when it is “normal” that others pray God every day and hope that He will cure their husband, help them find a job or save their soul in the afterlife? I do not believe in zombies, I do not believe in magic and I do not believe in God, yet I am very tempted sometimes to let myself drift into belief sometimes because I think belief is a very powerful tool of the human brain. I believe that some of my business ideas will be succesful: that alone brings me hope, courage and helps me think more about every idea I have, toy with it and squeeze out new directions, options and solutions. Still, as a non-believer, I keep a silver dagger, a gazoline jerrican and a chalk stick under my pillow! No sneaky attack intended on D and D or RPG. I am sure there are some really good campaigns I would find fun. Just haven’t met a good DM. To your other statements, you have good points. We have evolved in what is we know as reality throughout the centuries. The world not being flat, the earth revolving around the sun, and the ability to fly with the help of machines are just a few examples. The idea of television, cell phones, and even the internet are all things that were not seen as possible. So, who am I to say that vampires, werewolves, and zombies aren’t real? Belief in these things may not be punishable by burning at the stake in the modern world, but publically ridiculed is more often the case. Maybe I need to rethink this a little and start planning my defense plan. Do you have any extra chalk and a silver dagger laying around? Thank you for reading and submitting your comments.